In 2017, American Conservation Experience (ACE) partnered with the City of Flagstaff/Flagstaff Watershed Protection Project (FWPP) to thin 110 acres of hazardous fuels in Dry Lake Hills (north of Flagstaff) in order to reduce the significant threat of catastrophic forest fires and post-fire flood impacts for the area. 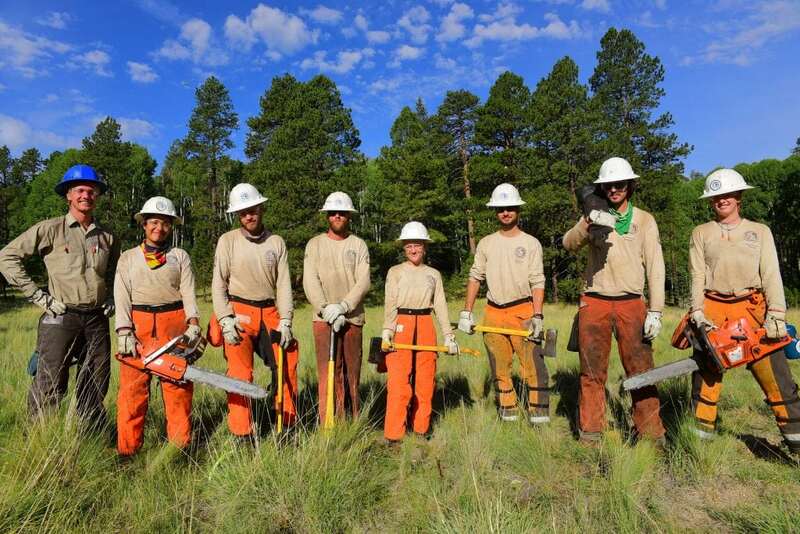 This successful partnership will continue in 2018 thanks to the support from City of Flagstaff, National Forest Foundation, and AZ Department of Forestry and Fire Management. ACE will be employing, training, and deploying 24 emerging forestry professionals to thin an additional 200 acres in Dry Lake Hills and Brookbank Meadow. Currently, the first ACE crew (pictured above) is deployed and thinning within the FWPP project area in the Dry Lake Hills. In the coming weeks two additional, eight person crews, will be joining them. The crews will be cutting small diameter trees that act as “ladder fuels” that can carry fire from the forest floor into the upper part of the forest canopy. By removing these small, under-story “ladder fuel” trees, the ACE crews are helping to reduce the risk of high severity crown fire in our beloved forest, in our own backyard!